I’m a huge believer that nothing happens to us and people don’t come in to our lives that aren’t intended to provoke a situational awareness and produce an intentional break in our way of being and thinking. I had one of those experiences in route to the Inaugural US Sailing Leadership Forum in San Diego this past week. 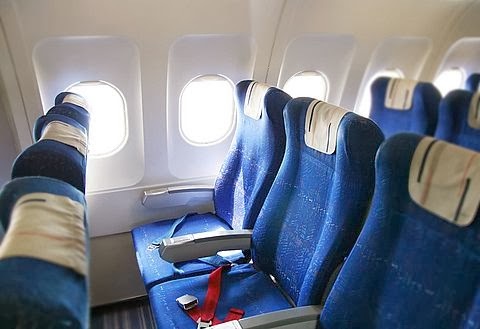 In what started as a day that dumped six inches of snow on Chicago and a hustle just to get to the airport, I was pleasantly surprised when I had a gentleman with a sailcloth folio take up the seat next to me. “Are you a Sailor?” I asked “Are you going to the forum?” – “I am” he responded on both accounts. That dovetailed into an exchange of ideas that lasted almost one half of the four hour flight to the West coast. My “seat neighbor” was Jim Spiegel the Executive director for the St. Joseph Junior Foundation in St. Joe’s, Michigan. Like most sailors- we shared a passion for the sport and a genuine interest in making sure that generations beyond ours continued to enjoy it. Our conversation covered everything from our start in the sport to the state of the sport and our vision for how we might change the dynamic. I learned a bunch from my new found friend, his perspective and the great passion that he has for sharing sailing with youth that might not otherwise have a chance to get out on the water. He shared the challenges that he is up against and we shared ideas on how he might approach those challenges. Looking back at the week, it truly set the tone for what US Sailing was looking to accomplish with the forum- collaboration. In looking at the age of the attendees and the number of women that attended the conference, it renewed my hopes that the sport is not going away easy. It takes these moments of sharing ideas for us all to get the successes that have worked in other parts of the country. In the opening session, keynote speakers Ken Read & Gary Jobson charged each attendee to come away with five new things. KEEP SAILING SIMPLE: As Sailors, we have a tendency to drink too much of the proverbial ‘Kool-Aid’. Because we are passionate about the sport- we expect everyone to see things through our ‘passion point’. This isn't always the case. In attracting a broader audience- we need to understand that someone with no sailing background is lost in the technical jargon that we so easily use to describe the sport. This key observation came when my fellow presenter Jason Thompson, stated that he found it ironic that the video that we showed of the America's Cup campaign looked interesting- but because he had no background in the sport, many of the ‘isms’ were lost on him. In this same category comes the fact that we focus way too much on sailboat racing. You have to walk before you run and often and there is a huge push to race before we truly get why sailing is special. Things change on the water. Getting people to “get” the lifestyle is important before we start complicating things with a whole new range of terminology and ‘rules’. Control our own Narrative: I’m cheating a bit on this, but this has been a pet peeve of mine for some time. If you open any sail publication – you will see a focus on the uber expensive and ‘out of reach’ boats. The ‘ooh –aah’ factor is “full on” and in play. What this portrayal does is further the narrative that sailing is exclusive, expensive and for the ‘select few’. How many times have you opened a business publication and seen a financial services ad with an old retired couple sailing into the sunset? It furthers the thought that sailing is so expensive and you can only do it when: a. you have a retired person’s schedule and b. have accumulated wealth. Nowhere, is there a discussion of the ‘spectrum of participation’ (more on that later). I would add to this that the imagery (i.e the advertising photos we use to depict the sport) we utilize to "tell the sailing story" needs to be consistent with the portion of the demographic we seek to attract. Simply put, we need to continue to show more women in the sport and more diverse participants. We know older participants are in the sport- that is great, but our story should show families using boats to commune and children on boats doing what kids do best- have fun. This is everyone's responsibility, but especially professional media and all industry stakeholders. We, the participants of the sport, need to be the ambassadors that talk about the lifestyle in simple terms. The fact that sailing is sensory stimulation that you can feel (wind in your hair; warm sun on your face); hear (turbulence of the water) and see (all the great scenery there is to see of the land from the water). It truly is one of life’s greatest experiences and in a way- a very therapeutic one where you forget whichever stressor you might be undergoing in your ‘on land’ life. STEM is the Way: I’ve been preaching this in my circles for some time. I have to say that very few of the sexagenarian and septuagenarians of the world ,don’t get this. The terrain in our country has changed from a production based economy to a consumption based economy. I read once that American school kids rank in the bottom fifth of industrialized nations. We currently import foreign talent in allied health sciences and computer technology because not enough of our own children take up the science disciplines as a course of study. A ‘sailboat’ is the world’s best science ‘wet lab’. As a science geek myself, I get this and personally, it pains me that many don’t understand that utilizing programs such as US Sailing’s REACH Program or the curriculum established by the National Sailing Hall of Fame Consortium (NHSHOF) are a positive for the sport. If community sailing centers are able to engage the application of STEM education and partner with public school systems, they will make sailing relevant again. The sailing part can augment a STEM based after-school program and be the laboratory that provides the practical application of geometry, calculus, applied physics, biology.. The list is endless. One reason, kids struggle with Math and Science is that they don’t see the relevance to their daily lives. If we use sailing and being on the water as the way to personalize Math and science, what might be otherwise ‘boring’ subjects in classrooms- become real and practical. They become relevant and sailing does also! It also allows us to take sailing to a whole new generation of sailors of diverse backgrounds that we aren't serving today. Diversity “What we look like today is not what we will look like tomorrow”: As someone who never ever thought they would end up on a sailboat, much less owning a company in the boating industry, this is very near and dear. Add to that, that I have two daughters and I harbor hope that the world they grow up in will be vastly different "than the one in which I did"- IS my driving force. I can revisit the statistics, but I think the picture is clear. For sailing (and boating in general to stay alive) it is imperative that today’s participants make the sport as inclusive as possible. The ‘low hanging fruit’ is at minimum meeting the statistical numbers on gender. More women active in sailing is good for the sport both now and in the future. Fast forward fifteen years… the girls in sailing programs or going on family sailing excursions today will someday have families. There is a greater chance that sailing will be a part of their stable of activities if they are engaged in the sport today. Short-term benefits and long-term benefits abound in this strategy- but it takes everyone promoting this. Extending the reach of the sport to ethnic groups that might not be predominant in the sport today- is also very healthy for sailing. Trust me, I’ve seen the ugly side where participants want to keep sailing as exclusive as they can for the privileged few. I’m realistic enough to understand that this group may be around, but it is slowly becoming the minority itself. Nature has a way of leveling these things you know. I’m confident after seeing the participants at the forum that the future of sailing is bright and inside of the stodgy old ‘network’, a new era of leadership is emerging- one that is younger and vastly different than those that came before them. This group will stand on their shoulders as they stood on the shoulders of those that came before them. Again- it will take every participant in sailing becoming ambassadors for this cause- ask someone new out to sail. Share your passion! 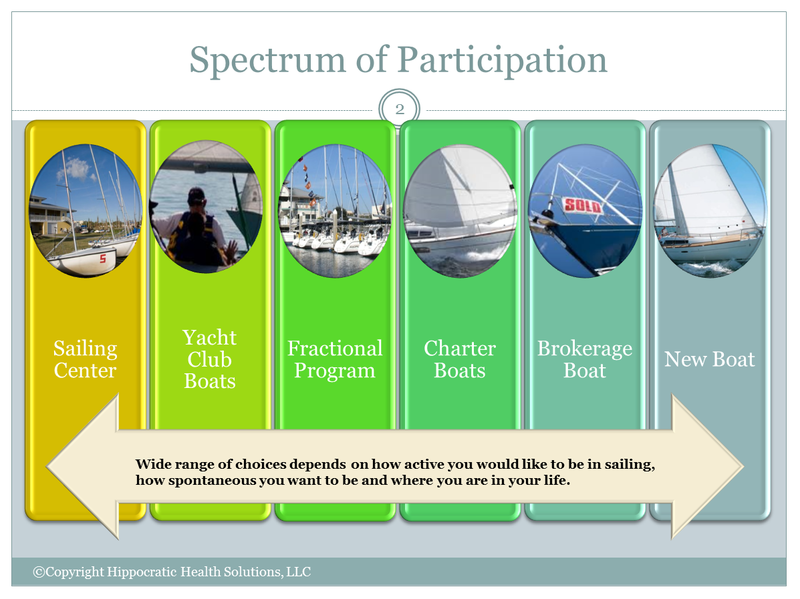 Sailing Participation is a Spectrum: In some segments of the industry there is a zero-sum mentality that prevails. Charter & Fractional sailing companies mystify the cost of participation at the expense of the sport. New boat sales compound the brokerage market in hopes of deferring used boat sales and redirecting towards new boat sales. What many of these groups have in common is that they operate out of scarcity and a dwindling market. They seek to carve up the “pie” vs. baking more pies. In order for sailing to grow (and boating too) they have to look at the market as a ‘delicate ecosystem’ in the words of NMMA president Thom Dammrich. The spectrum of participation is much like that of home ownership. There are apartments that people can rent, or condos that they can buy until they are ready for the ‘house’. It’s all dependent on what phase of the cycle they are in; how spontaneous they want to be (on a scheduled number of days or free to go when you can) or their time and availability. This spectrum has a place for everyone and at every price range for different budgets. The thing to remember about sailing is that you don’t need to own a boat to participate. It is in participating that you learn to love it and that may lead to becoming a greater stakeholder. This mission is a responsibility of everyone in the ‘ecosystem’- yacht clubs, outfitters, brokers, sailing centers, charter operators, fractional lease companies. Everyone needs to strive for new participants to achieve a quality experience at all levels. At the end of it all- it is important to move the sailing community past the awareness phase and into a phase of acting on our new knowledge. So the follow-up to this forum and action items will be most the most critical steps coming out of the San Diego forum. I have my list as I’m sure many attendees have theirs. It will be important for each participant to take their list to the local level and get busy. I’ll do my part. If you didn't make it this year- put the next SLF on your calendar. I challenge you to become part of what sailing is yet to become.